For the second straight year, it felt like the sky was falling in Tuscaloosca. The Tide sputtered offensively, committing five turnovers, and looked over-matched against Ole Miss in early September, in a game that looked terrifyingly similar to the 2014 loss. Was the Alabama dynasty under Nick Saban finally drawing to a close? Well no. Not at all actually. All Alabama did after that was completely shut down everyone else they played including LSU, Auburn, Mississippi State, Georgia and Tennessee. Then, Alabama completed their ascension back into the Playoff by taking down a weak Florida in the SEC Championship Game. Now, Alabama is trying to do something they didn't do by losing to Ole Miss: make good on some of their few mistakes in 2014, by winning a Playoff game. The Tide, for the second consecutive year, will get a Big Ten team standing in their way. Pretty quietly, Mark Dantonio has built an absolute powerhouse at Michigan State, winning 11 or more games in five of their last six seasons, and winning four pretty notable bowl games in that span. The Spartans immediately jumped into the Championship picture by beating Oregon in a thriller, but things looked like they were bound to unravel after that. Michigan State sneaked by some absolutely terrible teams in some wacky ways (cough, cough, Purdue and Rutgers) and looked doomed against a flaming hot Michigan team. But, then absolute craziness happened. If you haven't seen Blake O'Neill's fumble that was returned to the house by the Spartans by now, you probably don't know college football. Then, it seemed like luck had caught up with him, as they lost in a thriller to Nebraska, that featured a very controversial call. So, MSU was out of the Playoff race right? The season shifted completely once more, as MSU shut down Zeke Elliott and Ohio State en route to a huge win, clinching them the Big Ten East essentially. A pretty boring, physical win over Iowa in the Big Ten Championship Game clinched Michigan State a spot in the Playoff. 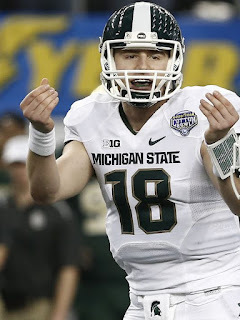 Much of the success over the year was due to senior QB Connor Cook, who kept the team grounded despite constant chaos. Cook threw for 2,921 yards and 24 touchdowns over the season, not insane numbers but consistent. He also cut down on turnovers and seemed to play better when Michigan State need him most. Joining Cook will be a solid group of backs, headed by true freshman L.J. Scott, who had a great Big Ten Championship. Completed with Aaron Burbidge, a truly dynamic weapon on the perimeter, and an experienced offensive line, Michigan State will bring a very balanced and consistent offensive approach to the table against a scorching hot Alabama defense. That Alabama defense seemed to take offense when they were questioned after the loss to Ole Miss. All they have done since then is shut down a number of great offenses and players, namely Leonard Fournette, Dak Prescott, Kyle Allen and Peyton Barber at Auburn. The Tide defense shouldn't suffer much even with Kirby Smart ditching to take the Georgia job. They have a ton of guys that are definitely going to be playing on Sundays, in typical Alabama fashion. Linebacker Reggie Ragland is a hungry, aggressive tackler, while the secondary is stocked with Eddie Jackson and rising Minkah Fitzpatrick, a young but superb defensive back. Up front, the Tide plug any holes for running backs, led by A'Shawn Robinson, Jarran Reed and more, all who weigh in at 300-plus pounds. Michigan State's offensive line is experienced and battle-tested, but even they haven't faced a defense with as much bulk and power as Alabama's. Though, Mark Dantonio is a great coach and he should have Michigan State's offense completely well prepared. Alabama does what Alabama does, and that means running the ball, a lot. They ran Derrick Henry to a Heisman, as the junior plowed over anything that dared stand in his way. Henry ended up rushing for 1,986 yards and 23 touchdowns en route to becoming the best player in college football. Most of Henry's success came in late in games, when the opposition was just too tired defensively to stop the mack truck of a back. He is also flanked by Kenyan Drake, a more change of pace back with more speed than Henry. That give defenses absolutely nightmares, containing a two-headed monster of a backfield. Though, if there remains a team that can stop the pair, it is Michigan State. Their defense is stocked with experienced leaders, who have faced plenty of hard runners in the Big Ten. They play sound, correct defense and are extremely disciplined. Just as important, they are good tacklers, as Henry runs through arm tackles like they are absolutely nothing. The Spartans will have to stop Henry for 60 minutes, which will obviously be one heck of a challenge, but they should fight admirably. Certainly the goal for the Spartans defensively is to force Alabama to throw the ball as much as possible. Florida State transfer Jake Coker has done a good job taking over the Alabama offense, but he still is pretty limited. He isn't good throwing done the field, and often panics if the pocket collapses. If massive Shilique Calhoun and the rest of the MSU defense can get some serious pressure on him, they will have a serious advantage. They will also make sure to stop true freshman Calvin Ridley, who has been on an absolute tear this season, quickly becoming Coker's favorite target. Michigan State's defense struggles if you can complete deep throws against them, like most do it isn't rocket science.. They communicate well for the most part, but diversity in the passing attack is a must. Unfortunately, Alabama just doesn't have much of it, which could play well into the Spartans' hands. This Cotton Bowl should be a pretty typical, grind-it-out football game, and should replicate a typical Alabama slugfest. Though, I think Michigan State is completely prepared for the battle. Alabama has not faced an offense as balanced or multidimensional as the Spartans' offense since Ole Miss, when they let up over 40 points. Alabama will still run the ball heavily, and they should still find at least some success in that aspect of the game. Even with an experienced group and a disciplined unit, Michigan State won't be completely able to contain Henry and Drake. Though, they should at least slow it down and force Coker's hand. Coker could very well have a great game, but the better chance is he won't, especially with a very cunning and ball hawking MSU secondary. Maybe I'm dumb for picking against Alabama. After all, they have only been beating down everything that comes near them for months on end now in the nation's toughest conference. 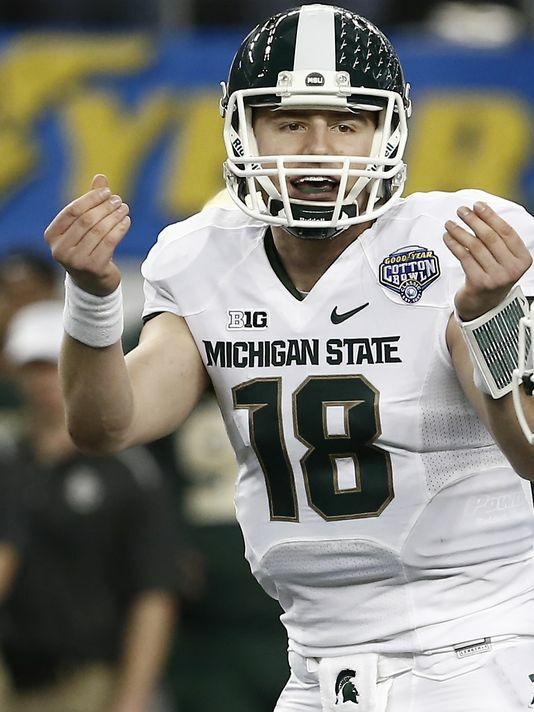 But, there is just something about this Michigan State team. Maybe their luck has ran out, maybe they just won't be able to move the ball. Or maybe, their strengths can completely attack Alabama's minimal weaknesses, and the Spartans can firmly prove to a national audience that this is a football program prepared to play on a Championship level for the foreseeable future.